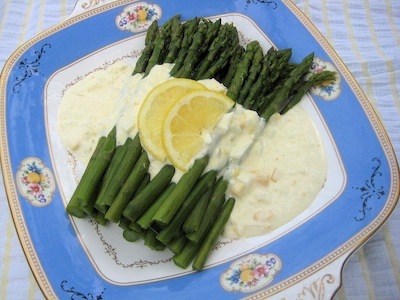 Asparagus with sunshine sauce is a recipe that my mother made every Easter Sunday for years. It is about the simplest most elegant and delicious recipe that you’ll come across as a side dish. Prepare the asparagus your favorite way. I cook fresh asparagus in a skillet full of water and from the time I turn on the heat to the time the asparagus is tender enough to eat is about seven minutes. Then I drain and dry the asparagus on a “tea” (kitchen) towel, put it on a pretty platter, lap it with the sauce and you are all set. Cook or steam the asparagus. I put fresh, trimmed asparagus into a skillet and add cold water to cover. Set the skillet on the stove top. Turn the burner on high and cook for 7 minutes from start to finish. Test the asparagus with a fork to make sure it is tender. If you like your aspaparagus with a little “crunch”, cook it until a fork inserted has a little resistance. In a small saucepan, pour wine over the onions. Stir in lemon juice and mayonnaise and heat just to boiling. Gently stir in the eggs. Serve the sauce hot over the asparagus spears. Serves 4. *You will notice that my mother’s recipe calls for sauterne. It is cooking wine. So, if you would like to use another wine such as a chardonnay, then by all means do. I never criticize anyone else’s choice of food preparation because there are certain areas where some things were hard to get, and you may also not want to buy a bottle of wine for one-quarter cup worth. I know that my late mother’s husband still makes this dish and he has told me that you can use sparkling white grape juice in place of the wine.